As trends in theatre go, the immersive genre just keeps expanding and redefining itself. This week, some of my own students staged a piece called The Ward which entailed masked audiences, elevators, stairs, four different spaces, touch, taste, smell, specially created video and a cast of 24. It was risky, edgy and played with the form very successfully. We were all delighted with piece and no more so than its creators, deservedly so. Face-to-face with witches in an underground car park. Feasting with the Macbeths. Bedding down for the night on the 27th floor as a siege rages around you. Characters sleepwalking through the walls: confiding plots, summoning apparitions and conspiring murder. In the morning waking to find the battle lost or won. This is William Shakespeare’s Macbeth seen from the inside out. This production like a fever-dream leaves you questioning ideas of space and status; dystopia and utopia; waking and sleeping. Felix Mortimer, artistic director of Rift talks in this documentary about how they work – in this case on a production of Kafka’s The Trial. Meanwhile in Australia, the Perth Festival International Arts Festival is in full swing and immersive is clearly the order of the day with Punchdrunk, Look Left Look Right and Rimini Protokoll are all presenting wildly different immersive work. Punchdrunk’s The House Where Winter Lives is for 3 to 6 year olds, Look Right Look Left are performing a reworking of their city-specific work, You Once Said Yes originally made for Edinburgh and Rimini Protokoll are staging Situation Rooms which requires its audience of 20 to wear headphones and carry iPads. Australian writer and critic, Jane Howard, wrote about all three shows in her article for the Australia Culture Blog, The Guardian. In it she talks to the creatives behind the pieces. While the headline shows of the Perth festival may be playing to hundreds at a time, in pockets all around the city this week performances are happening on a much smaller scale. These immersive theatre pieces are reliant on the actions of audience members to stage the work: from the solo audience of You Once Said Yes to the tightly choreographed interaction of audience members in Situation Rooms to the rambunctious collaboration of children in The House Where Winter Lives. That much is certainly true. 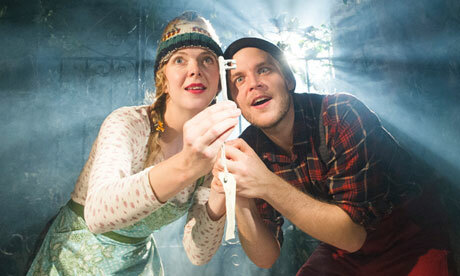 The adventure sees Mr and Mrs Winter take the audience of three to six-year-olds on a journey to discover the lost key to the larder. While Punchdrunk have created many immersive works for adults and even older children, this is the first time the company has pitched at such a young age group – and when you see their reactions it’s easy to think that this audience is perhaps the perfect age to be experiencing this work. Entirely without ideas of what “theatre” should be or how you should behave when watching it, they fully invest in the world. Punchdrunk give the children a high degree of autonomy in their reactions. “We’ve got the script and we’ve got the structure and we’ve got certain things that we can do, and then we know when we can riff a bit and let them fill in the answers,” says performer and co-creator Matthew Blake. Allowing for audience response and choice is also central to You Once Said Yes, a show performed on the streets of Northbridge for an audience of one. That person has to be directed to a certain extent, concedes production manager Rosalyn Newbery, but “that has to be done sensitively and without dictating, because their responses and their reactions are very important, and they will change certain things”. The title, she says, strongly suggests to the audience how to respond. Yet they can still say no, they can take an alternative route from that which is expected of them and the performers and production team must know how to be responsive to that. Many immersive theatre pieces rely on these interactions between the audience and performers and the self-direction and personality the audience invests into the work and the world. Rimini Protokoll’s Situation Rooms is the exception to this rule. The documentary theatre piece invites the audience to step into the shoes of 10 people each as they talk about their relationship with the weapons industry. Following instructions on an iPad mini, with the world on the screen mirroring the environment built by the company, the audience move and silently interact in the exact place of the person whose story they’re hearing. While Situation Rooms aims to highlight the realities of a wider world, You Once Said Yes is about highlighting the realities and personality of the participant. Being involved in the presentation of such immersive work holds “massive privilege” for an actor, says Rowland. That is one of reasons that people have responded so well to the show, he argues. As I logged into Twitter on Saturday evening, the tweets cluttering my timeline were, unusually, united in startling agreement. 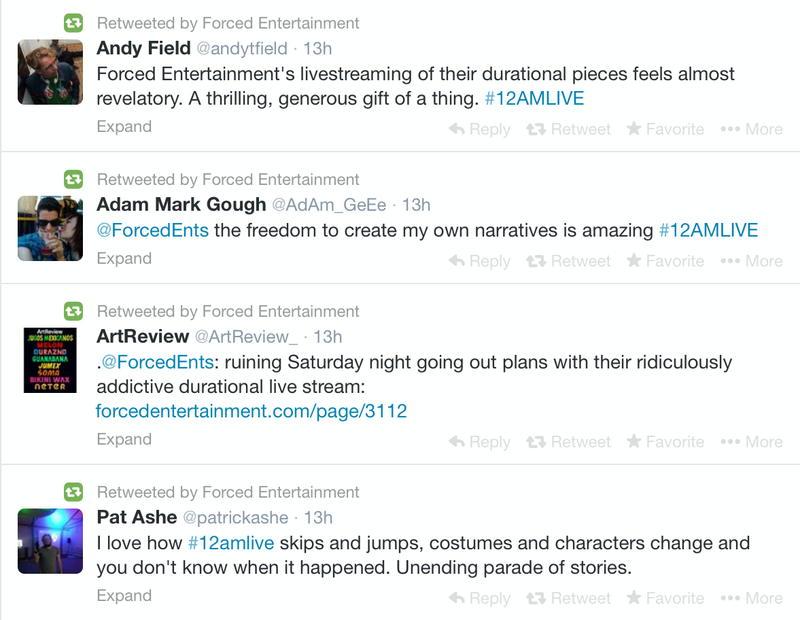 Nearly everyone I follow seemed to be watching the same thing……an online live stream of Forced Entertainment’s six-hour durational show 12AM: Awake & Looking Down. Everyone who tweeted was watching it in a different place, from their bed or sofa or desk, but these scattered individuals were also watching the show together, as part of a separate but collective audience meeting in an online space. This observation feels significant in light of renewed debate around the increasing practice of streaming theatre productions, be it huge operations like NT Live screening in cinemas across the country or modest webcasts of experimental performance. A number of theatre makers have expressed concern about these recordings replacing live performance, while Lyn Gardner recently mounted a persuasive defence for the expansion of audience reach that these screenings allow. Both sides of the argument make valid enough points. 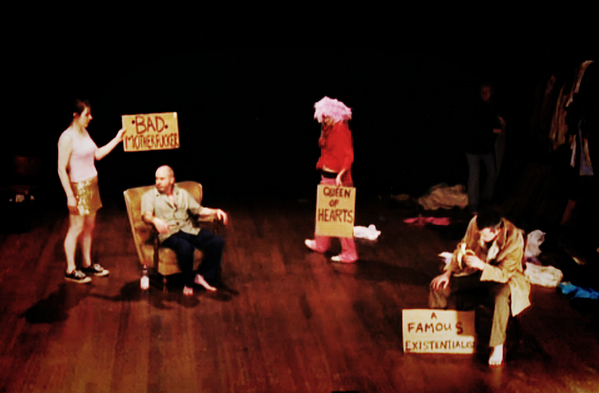 Those who take issue with the recording of performances protest that it somehow pollutes or detracts from the uniqueness of the live event, releasing viewers from the attention that is required of them in the theatre and encouraging audiences to retreat further and further into their screens, while live performance withers away. The digital advocates, on the other hand, argue that screening theatre events can take them to a bigger audience in just one night than they might otherwise reach during a whole run, not to mention offering an opportunity for those without easy access to a theatre to engage with an art form that might otherwise be unavailable to them. As Gardner points out, it doesn’t have to be a case of either/or; enjoying a performance online or in the cinema does not preclude the possibility of also taking a trip to the theatre. The two experiences offer different benefits. What I’d rather focus on, however, is the accusation – often levelled at streamed theatre – that it removes the collective, live experience of being part of an audience. It is implied that this is one of the key reasons for attending theatre rather than watching TV or sitting in front of a computer screen. In the modern world, the theatre is one of the few places where we can still have a live, unmediated experience, surrounded by other human beings. And this is, to an extent, true. Forced Entertainment’s 12AM: Awake & Looking Down. But what I witnessed on Saturday night looked an awful lot like an audience all having an experience together, even if that experience wasn’t in the same room. 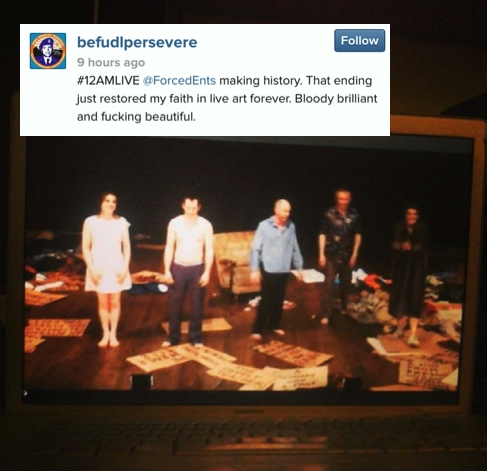 The same thing happened to an even greater extent throughout the 24 hours of Forced Entertainment’s Quizoola!, live streamed from the Barbican last year, and a similar online buzz has attended other webcasts by theatres such as the National Theatre of Wales and Hampstead Theatre. On these various occasions, I have experienced a rare feeling of real community online, as a wide range of people all gather round one enthusiasm and exchange thoughts and responses. Sure, it’s not quite the same as having those reactions while sitting in the same space and breathing the same air, but the feelings and thoughts that the online experience provokes belong to the same family as those encountered in a theatre. And once audiences are hooked on the shared experience, who’s to say that they won’t seek it out again and again, both on and offline? I couldn’t agree more. 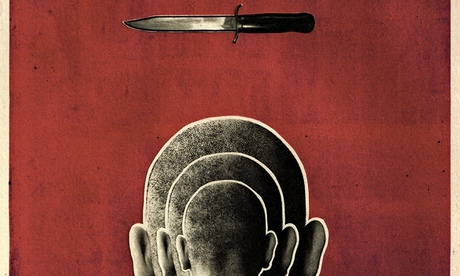 On the other hand, I was also interested to read this this by Ryan Gilby, for The Guardian, where he reflects on a different kind of live broadcast theatre event. The next shock was finding that I had come to see Coriolanus starring Emma Freud. Cinema audiences have long suffered all manner of irritating pre-film ads, but the appearance of Ms Freud on screen, whipping us into a frenzy about what we were about to see, was at best superfluous (we didn’t need persuading: we’d already bought our tickets) and at worst obstructive. None of us were under the illusion that we were actually at the Donmar Warehouse where the play was staged, or that the actors would be with us in the flesh. Nor did we want to be made to feel we were watching an early-evening relay from the Big Brother house. Next came a short film in which the lead actors, Tom Hiddleston (Coriolanus) and Mark Gatiss (Menenius), contextualised the play. The director, Josie Rourke, popped up to comment on the Donmar’s history, while the designer, Lucy Osborne, showed some examples of Roman graffiti on her iPad. I rarely bother with the featurettes that are routinely found among DVD extras and here was a reminder why. Such items can get in the way of our interpretation rather than enhancing it. The effect here evoked neither theatre nor cinema but bad arts television. It was even worse at the end of the interval when the two-minute bell urged us back to our seats and we were shown an interview with Rourke during which Freud reminded her that Hiddleston had been named “the sexiest actor on the planet” by MTV. Hardly the words you want ringing in your ears as Act Two begins. My advice for the NT is to cut the chat and get on with the show. Suspension of disbelief in a play is not hard to achieve but it deserves to be given a fighting chance. Thankfully the dynamism of the production was irresistible. Rourke’s staging made judicious use of minimal props – chairs, mainly – and a set that was effectively one brick wall, half of it painted a richly stewed burgundy. My concern going in was that performances pitched at theatre level might seem overblown on a cinema screen; these are, after all, two entirely different forms of acting. I had reckoned without the cast’s combined experience of calibrating performance for contrasting art forms. That Hiddleston chap, he’s done bits and bobs on film as well as on stage, hasn’t he? 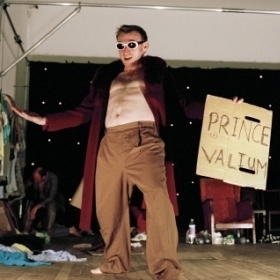 And Gatiss – he’s been before a camera once or twice. Birgitte Hjort Sørensen, who plays Coriolanus’s wife Virgilia, has a fair bit of Borgen under her belt. They’re getting the hang of it by now. It helps that these broadcasts are geared toward the cinema experience; the theatre audience for Coriolanus last night paid reduced ticket prices on the understanding that cameras would be getting in their way now and then. For one night only, the popcorn-munchers took priority. Not that any of us were actually eating. The mood of the audience was just as it would have been in a theatre: hushed, respectful, even tense at times. 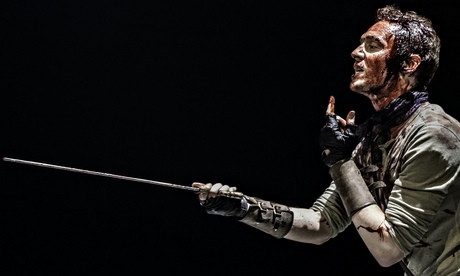 There were gasps during Coriolanus’s death scene, elegantly staged in a beam of light and a spray of red – an image foreshadowed earlier in the show when the gruesomely scarred warrior showers in a trickle of water before shaking himself like a sheepdog, sending bloody droplets flying about the stage (and screen). Though lighting can alter the emphasis of a scene, theatre has no equivalent to the close-up, and the camera positions respected that fact: we never felt artificially intimate with the actors, but nor was there a sense that we were too far from the action. With one exception: the curtain call. Here a chasm opened up between the theatre and cinema audiences. There was some confusion over how best to respond. Most people in the packed cinema applauded. Did they think the actors could hear them? For clarity’s sake, Emma Freud is what is perhaps best described as a cultural commentator well-known in the UK, and fronts arts and cultural shows on both television and radio. 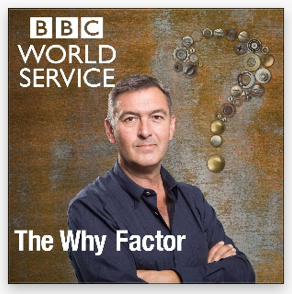 I can but only sympathise with Gilbey – perhaps the solution is to simply give the broadcast audiences the same programme/play bill that the ‘live’ audience get, then if they want to know more, they can read quietly, to themselves. 12am is a physical and visual performance that explores the relation between object and label, image and text…..The piece lasts anywhere between 6 and 11 hours and…..the audience are free to arrive, depart and return at any point. The particular production lasted 6 hours and although I only watched for just over an hour (the stream to Hong Kong was a little too stuttering to sustain more than that) it was an event that I enjoyed being part of. Both Forced Entertainment and Tim Etchells were live tweeting alongside it, as were people around the globe who were watching too, which added to the experience. It felt very ‘live’, but it was the fact that it was a new ‘experience’, a new type of theatre, that I think I enjoyed it more. These tweets give you a flavour of ‘how’ people were watching and interacting, and they themselves, for me at least, became part of the narrative as it unfolded. Other people, as the tweet above shows, were clearly having the same experience. But it was the one below that really made me sit up and realise what I was actually witnessing. The stage is indeed a precious space, and what happens between actor and audience member therein is both magic and real. But we mustn’t forget that plays are both ephemeral and eternal. A play is written to be performed, but performed again and again on new sets by different actors in reimagined contexts. 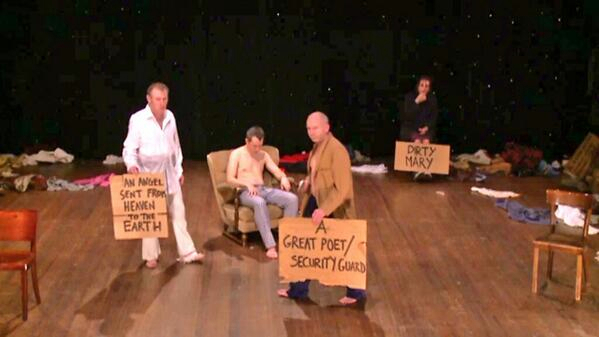 The tension between the live and the repeated is inherent to most theatre. It was more gratifying to witness the responses to our watch-alongs, where people around the globe tune in and press play on a production at the same time and are suddenly able to visit the West End, albeit virtually. It’s as though the breath formed to articulate a Shakespearean monologue, the energy emitted between an ensemble, the tear that falls from a performer’s eye, is the butterfly’s wing and we – with all our technology, our media, our distance, our global experience – are the hurricane. She is referring to an experience, not unlike watching 12am for me. 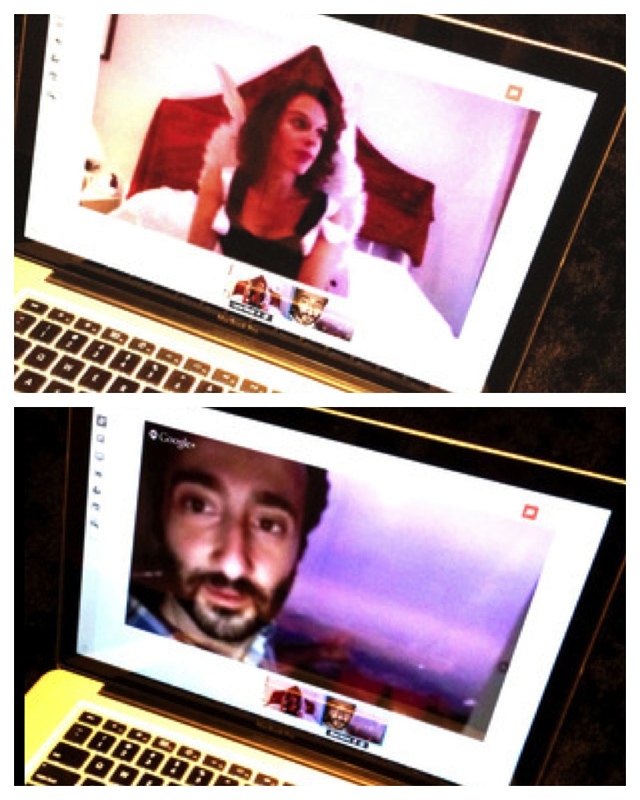 Digital Theatre’s watch-alongs are dependent on social media, both to generate an audience all watching remotely at the same time as well allowing for a communal commentary along the way. Twitter replaces the real life audience, so rather than turning to your fellow theatre-goer for affirmation of a shared experience, you tweet it instead. It’s also just struck me – a little off the point – that watching theatre in this way gets rid of the errant rings and glaring screens of mobile devices, hacking coughs, sweet wrappers being opened and latecomers that pervade the ‘live’ experience. Castell (and many others I have read recently) are struggling to define this new live theatre experience, let alone give it a name. Whatever we eventually end up labelling this vanguard movement, I know I will be in the front row. One of the smash hits on the London stage at the moment is Coriolanus. It is one of Shakespeare’s more violent plays with big, bloody battle scenes, riots on the streets of Rome and battles on the Senate floor. This current production, starring Tom Hiddleston has been roundly applauded. ’ve worked for 20 years in theatre and film as a fight instructor and stunt coordinator, but I trained as an actor, so in many way, working in theatre always feels like coming home. My part in the production is to create an exciting fight, which has energy and pace, develops the characters and the plot – and to do it all safely. The fight director is involved from the very beginning of a production. Wherever possible I like to sit in on rehearsals to get a better sense of the world the director is trying to create. For Coriolanus, Josie (Rourke, the director) outlined the contemporary feel of the play and talked about the Roman look. We had to merge those two elements in the fight scenes. The director will tell me if they envisage a more visceral, hard-hitting or a swashbuckling-style fight. We’ll also discuss any specific plot elements that they wish to include. In Coriolanus it was important to establish Coriolanus as a warrior and Tullus Aufidius as a worthy adversary. Research is part of how a fight is put together. I might visit museums to look at how a warrior, at that time, would have fought and moved. For Coriolanus, I looked over illustrations of Roman tactics and battles and discussed with Lucy (Osborne, the costume designer) a need for a range of movements (so that skin doesn’t chafe). We make sure the metal of the stage armour is lighter than real armour and the sword blades are made of aluminum, not steel. They would still cause damage if they came into contact with the body, though. We were lucky that Lucy got us the boots early on in rehearsals, as their weight and grip changed the type of choreography. I also talk to the set designer and lighting technician. Principally, I need to ensure that the actors can move around the stage, can see each other’s movements, and that they won’t slip or fall. The actors need to be able see the swords as they fight. Losing sight of the blade in a beautiful sidelight is dangerous. I’ll ask for areas of the stage, which see heavy fighting, to be reinforced. The safety of the actors is crucial, everything from the type of floor to the consistency of stage blood is thought about (in case the actors slip). If a piece of furniture is going to be slammed into, then you reinforce that particular bit of the set, so no one is hurt. One can talk a good fight, but it’s in the doing that all the work happens. After discussion with Josie and armed with an idea of costumes and weapons, the next step is to start choreographing – and to put the fight on its feet. I sketch out on paper what I think the floor pattern of the fight will look like, but that’s just for myself. The fight is crafted in the rehearsal room, with and on the actors. The actors might be left or right-handed or have an old injury that makes them hesitant. I base the fight on the story and what the actors can do. Their involvement is key. I need to create a fight scene that is exciting, but that’s also sustainable for the actors to perform eight times a week. In rehearsals, safety is very important. I’m a fencing coach and black belt martial artist so I’m aware of potential injury. There are crash pads at the back of the room, for when an actor is thrown. I also have back pads, knee and elbow pads. In one fight, both Hadley Fraser and Tom Hiddleston are thrown as they grapple and the crash mat was used as they learned and became familiar with the mechanics of the throw. So that swords don’t actually hit the actors we use a technique called “off-line”. The sword basically makes contact with the area that an actor was previously in. The actors continually watch for spaces to move into. There’s a structure to a fight, which is like a dance; the moves are done over and over until they are second nature. In early rehearsals you see an actor counting out the moves (one, two, three…), but by the time the show opens, they’re invisible. Ensuring that the actor is able to convey their character in a fight scene is fundamental to my brief. In Coriolanus I need to establish Coriolanus as a warrior and Tullus Aufidius as a worthy adversary. We also need to confirm Tom as a leader, which is achieved through a combination of what he does, the way others respond to him and using stagecraft to ensure he is in strongest position on stage. In the action, similar principles apply. Tom (Coriolanus) has minimal, but definite movements, whereas junior warriors would quite simply move more. We’d contrast a confident stillness for Tom, with a more edgy, nervous physicality of a less experienced soldier. Tom and I tried to develop an icon fight style, reflective of his vision for Coriolanus. We settled on a signature low stance, from which he launches into explosive attacks. The energy of a fight scene should build. You do this by creating the illusion that the fight is picking up pace. You start the fight with the actors doing bigger moves – and reduce them in size as the fight gets more intense. You also reduce the number of pauses in the action, as anger builds. It gives the illusion that the moves are faster and more violent, that tempers have frayed. But it’s an illusion; the reality is it’s very controlled. I had the good fortune to teach Tom swordplay at RADA. Then, as now, he was diligent, enthusiastic and physically fit. He also contributed ideas – and did so on Coriolanus too. Tom and I had been debating whether to “play” an injury, after he was thrown. I wasn’t convinced it would work. So, in a run through of the fight – with the rest of the cast present, who hadn’t been privy to our conversation – Tom landed from the throw and faked the injury. It worked wonderfully and the rest of the cast liked it, so I conceded that Tom was right. Tom had a broad grin for the rest of the day. 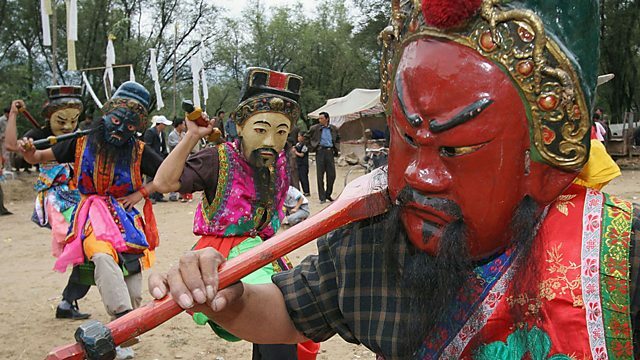 Not surprisingly this set me off on a research trail and I was quite astonished by what I found – mountains of information, societies, guilds, guides, schools and even lesson plans about stage combat. 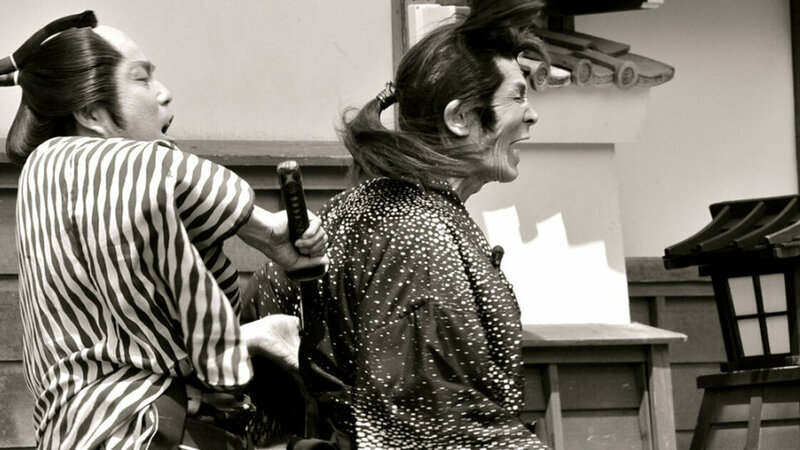 One article from Armour Archive deals specifically with sword fighting, Stage Combat 101. Meron Langsner, himself a fight director offers loads of links to all things violent on stage. Brigham Young University Theatre Education Database offers four lessons and associated resources, including a great little Terms and Definitions document. Then there are instructional videos like this one from Armstrong Atlantic State University Drama Professor, Pam Sears, revealing the tricks to the illusions of combat in theatre. There are professional bodies, such as the Society of American Fight Directors and The British Academy of Dramatic Combat who train actors and certificate teachers. 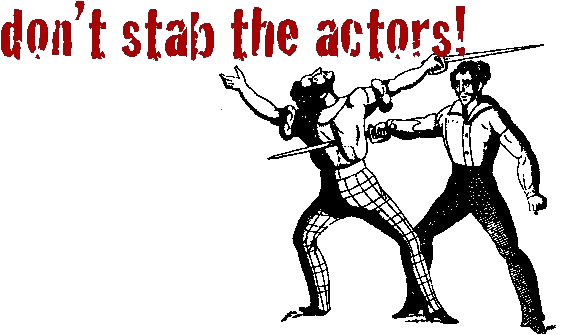 There are people who blog about stage combat, my favourite being I’m So Not Going To Hit You. There are even Facebook groups, such as Girls Fight, which is set up to promote women in stage combat, of which there are few. It seems to be a male dominated profession. Having said that, there is a great little interview here with Alison de Burgh, who was the first ever professional female fight director in the UK. What is clear, and I always knew this of course, is that stage combat is highly skilled and potentially very dangerous if you are not trained properly. There is a scary list of when things have gone wrong here. So as we say in an increasingly litigious world, Don’t try this at home, kids!